A study recently conducted by Iran’s Ministry of Health showed that 47% of women and 44% of men over 50 years of age have deficient bone density, and 6.4% of people aged 20 to 70 years have osteoporosis of the spine. Moreover, one of every 4 Iranian women over the age of 50 has osteoporosis. Globally, this figure is one in every 3 women; 1 in every 5 men over the age of 50 also suffers from osteoporosis. Statistics in Iran indicate that 50% of people with osteoporosis have hip fractures. The use of baking soda in bread is a main cause of a lack of calcium in Iranian people; 58 million people in Iran suffer from a calcium deficiency. The use of dairy products in Iran is very limited. Encouraging the consumption of milk enriched with vitamin D, exercise for all age groups, and modifications to dietary habits may partially prevent osteoporosis. Larijani B, Resch H, Bonjour JP, Meybodi HA, Tehrani MM. Osteoporosis in Iran, overview and management. Iran J Public Health. 2007;Suppl:1-3. 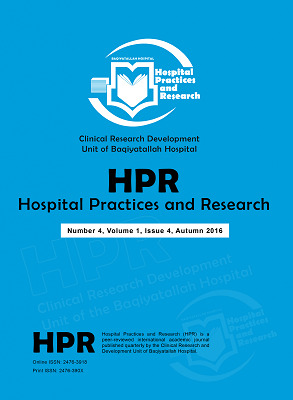 Pirdehghan A, Vakili M, Dehghan R, Zare F. High prevalence of vitamin D deficiency and adverse pregnancy outcomes in Yazd, a central province of Iran. J Reprod Infertil. 2016;17(1):34. National Institutes of Health. Dietary supplement fact sheet: vitamin D. https://ods.od.nih.gov/factsheets/VitaminD-HealthProfessional/. Published 2011. Rahnavard Z, Zolfaghari M, Hossein-Nezad A, Vahid Dastgerdi M. The incidence of osteoporotic Hip fracture: Iranian Multicenter osteoporosis study (IMOS). Res J Biol Sci. 2009;4(2):171-3. Tajvar M, Arab M, Montazeri A. Determinants of health-related quality of life in elderly in Tehran, Iran. BMC Public Health. 2008;8:323. doi:10.1186/1471-2458-8-323.